Sincerest apologies for not blogging in ages! I've been home since the end of May, but with re-settling (unpacking, cleaning, organizing), re-connecting with friends and family and starting two new businesses while simultaneously continuing to grow my existing editing business (I'm in the throws of editing an amazing novel!!! ), purchasing a new vehicle (and all that that entails: insurance, getting new plates and, um, learning how to drive it...Yeah, it's standard), and planning a wedding (not, not mine, but my best friend's), life has been hectic. However, before I get into all the new news in Canada, let me recall the last bit of my trip in Paris. Paris's historical elements are one of it's charms. This was a feature of Japanese culture that always made me experience awe and a sense of wonder: visiting a spot where people and monuments/structures/natural elements that were all extraordinary at a time preceded my journey by hundreds to thousands of years. Who am I? I'm one person, and let's face it, most days I feel insignificant. To know that I've simply existed where something historically significant has occurred feels unreal. In Japan this happened all the time, but one of the most inspirational was Tōshōgū Shrine in Nikkō. The separate entrance to the gift shop. I love the clock! This was one of my favourite. I'm not even sure why, but I was drawn to it. Love the pout, but I was extremely curious as to whether this was comfortable to sit on (of course, it's not permitted). The shadow that this sculpture cast was so cool! I felt like she was just going to up and float away from it all. Haven't we all wanted to at some point? The L'Espace Dali was great! I didn't stop there though. Obviously, I had to just make a "quick" stop by the Louvre. Holy ka-moly! It's huge! There was no way I could have seen everything in ONE day. I limited my time to half a day. The grounds alone were reason enough to visit. However, I thought it might be worth checking out that insignificant painting that a friend told me see: the Mona Lisa. *wink-wink*. I was told it's not large, so not to have unrealistic expectations. The room where the Mona Lisa is encased isn't large either, so I squished myself into the space and waited at the back of a large crowd standing tip-toe to try and see the masterpiece. People slowly cleared and I was able to come face-to-face with a painting that's both unwavering in its fame and shrouded in mystery. Of course, she's beautiful. She's clearly loved by many. 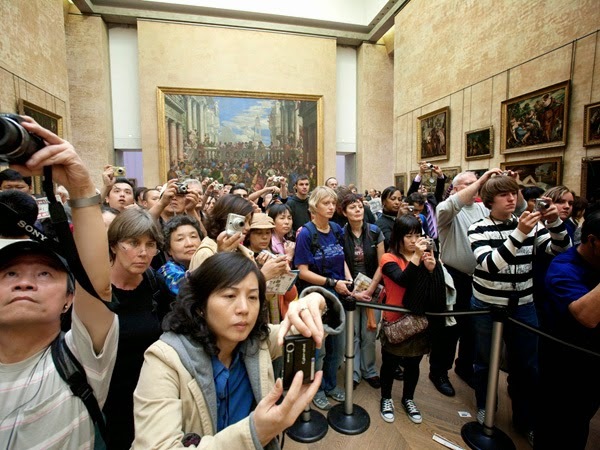 This wasn't taken by me, but it's one of my favourite photographs of the Mona Lisa (photo credit to Catherine Karnow, via National Geographic: http://travel.nationalgeographic.com/travel/photo-tips-icons/#/crowd-louvre-paris-karnow_60362_600x450.jpg). LOVE these paintings by Italian painter, Giuseppe Arcimboldo, The Summer (2), 1573. Mona Lisa behind glass with reflections of the crowd. I can't remember which ceiling this is, but it's beautiful!!! Sketches and paintings of Baroque architecture. I LOVE BAROQUE!!! A different perspective of the pyramid. This was the last view I had of the Louvre. At this point I hadn't seen the Eiffel Tower. I kinda felt like Carrie in the HBO series, SATC where she sees the Eiffel Tower, but it's always from afar. I wish I'd gone back to the Louvre for a second time. The first time we went, a really kind married couple (I think American), accidentally purchased four tickets instead of two and gave us two entrance tickets! It was very kind of them. We were simply the next people in line behind them and they kindly gave us the tickets!!! I loved the architecture of the actual museum and it made me want to go to Versailles EVEN MORE! Unfortunately, while I was in Paris, the workers went on strike for the entirety of my trip and so I was unable to see the palace that I've been waiting eons to see...Alas, it will have to wait until my next visit to France. I think the next time I go to France I'll go into the south or countryside. I loved Paris to be sure, but I wished I could have seen the rural areas, eaten more cheese and drank more wine. Regardless, France was one of the most amazing places I've ever been. It's no surprise that it's the most visited country in the world, that is, according to Inernational Business Times (http://www.ibtimes.com/10-most-visited-countries-world-1253315). If you haven't gone, go. If you can't afford it, save. Do it. Now. You'll fall in love in love with everything the country has to offer. I ate this on cooler day to get warm. It was awesome! This French onion soup was so hearty I was full before my meal got to me! I made it my mission to eat every popular French dessert I could. Here are a few I actually took photos of (lemon tarte and mille feuille, crème brûlée, and below, a "floating island" which is a meringue floating on crème anglaise). I should also mention that I ate macaroons, éclairs, a baked apple-pictured below the floating island, a strawberry tarte and, although not a dessert, chocolate croissants (as well as butter croissants). Baked apple with caramel sauce-delicious! Duck confit-the meal that came AFTER the hearty French onion soup and before the floating island...I HAD to walk that off even though we were a bit tipsy, lol! I know this is in France, but I really want to submit this to http://www.engrish.com/. If you need a laugh, go check it out! Ha Ha love the pictures and the humor. And of course thanks for the food fix. what I really like is that you showed just how many people you have to get through to see the famous pieces. Not the quiet serine sence the movies leave you with. Hi Leah! Yeah, the Louvre was PACKED and we were told it wasn't even high (tourist) season yet. UGH! It was incredible how small the actual size of the Mona Lisa is! I was told it was small, but then I got there and I thought, "Woah, it's REALLY small!" I think the movies and most people's perceptions are that it's much bigger!